Think you might need a hotel room to hibernate in after dancing the night away at the Grizzly Rose? Not to worry, we’ve got you covered. There are several hotel options nearby to suit any budget or preference. Each one offers a host of amenities to be your home away from home. 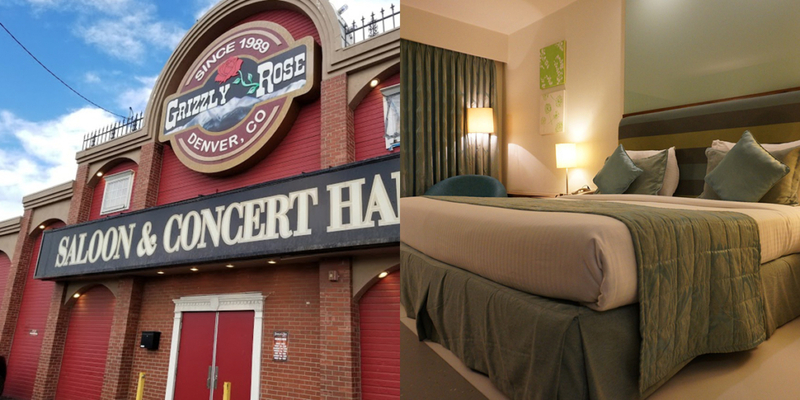 If you’re coming into town for one of our boot-stompin’ concerts or wild nights, we’ve got a list of hotels near the Grizzly Rose. Make sure to take an Uber back to your room and stay safe! This Super 8 consistently gets great reviews on friendliness of staff, cleanliness and functionality. While it’s nothing fancy, it’ll get the job done for $61 a night on average, including breakfast. The 1-mile journey will average around $11 for an Uber, which is not too shabby. If basic but clean lodgings are what you’re on the hunt for, the Quality Inn Denver Central has you covered. The property features a restaurant, WiFi, free parking and breakfast, all for about $91 a night. The rooms are clean, the staff is friendly and it’s under a mile away from the venue, which means your Uber will average about $9. Score! While a Comfort Inn generally isn’t going to be a 5-star Ritz Carlton resort, it’ll get you through the night and next morning in…you guessed it, comfort! This Comfort Inn is pet friendly, has a small outdoor pool and a free hot breakfast in the morning. A bonus? The bedding is super comfortable. A room here on the weekends will average you about $107. You can easily Uber to the Grizzly Rose from the hotel, for a ride that’ll average around $11. Just a mile north of the venue, this is the closest hotel you’ll find in the immediate area. This Radisson Hotel offers free breakfast, a pool, gym and comfy bed for an average of $102 a night. They also have a restaurant and bar onsite, which means you can pregame before heading down to the Rose. This hotel is a little over a mile away to the southeast. The 5-minute Uber ride will put you out approximately $9-13. This laidback hotel boasts an easy-access perch in Denver’s famous RiNo, or River North District. Several cool craft bars and clubs can be found in this eclectic art region. The La Quinta also offers a free continental breakfast, Wi-Fi and parking. An Uber ride to the Grizzly Rose will cost about $9-15 for the 2-mile journey. You can usually find a room at this hotel for an average of $95. The Hotel Indigo line is a new offering from parent company IHG, which means anywhere you find one its’ guaranteed to be gleaming and state of the art. The Hotel Indigo Denver Downtown is based on a minimalist modern approach to the woodsy atmosphere of Denver. You’ll find a lot of clean lines, stainless steel and wood accents in this modernist space. With a bar, restaurant, gym and elegant room furnishings, Hotel Indigo Denver is a comfortable and chic place to stay for your Grizzly Rose excursion. An Uber from the Hotel Indigo will run you about $11-20 for the 3-mile trek. You can expect to shell out a lot more for the cost of the room, however. It’s not uncommon for a room here to be just over $200. If ritzy is what you’re after, the Four Seasons Hotel Denver should do the trick. Rooms run up to $400 here easily. The hotel offers high-rise rooms and chic suites alongside a fully furnished gym, luxurious pool, fine dining options and its’ own spa. This is a great spot to spoil yourself for a night or two on the town with five-star accommodations. The hotel is approximately 6 miles from the Grizzly Rose. The journey will cost you about $14-22 in an Uber ride, but if you’ve decided to splurge on the Four Seasons you may just want a limo after all.